As we reach the centenary of the mid-point of World War 1, it seemed appropriate for the Wargrave Local History to look back at its September meeting to see what was happening to Wargrave and Wargravians at that time - drawing on a variety of contemporary sources. Wargrave in 1914 was a typical rural village, the parish having a population of about 2000. The Conservative MP for Worcester, Edward Goulding, lived at Wargrave Hall, and several members of the Coalition Government were staying there on the night before war was declared, and it is said that other meetings of the Cabinet took place at Wargrave Hall during the course of the war. The first sign of war-time activity in Wargrave was reported the Parish Magazine at the end of 1914, when it was noted that the people of Wargrave welcomed the soldiers and would make them comfortable in every way. 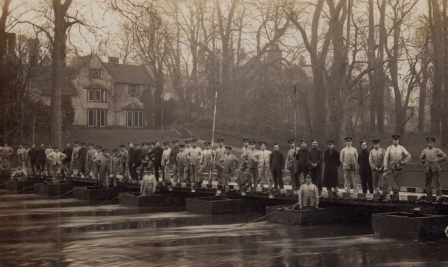 These were the Royal Engineers, who camped here whilst learning how to build pontoon bridges across the River Thames. The major impact on Wargrave was, of course, the men who "joined the Colours" to serve in His Majesty's forces. The village memorial stands on Mill Green, but of course, the memorial only records the names of the 'fallen', but there were many others from the village who served, whose names are not so 'well known. It is impossible to detail them all, but a few were highlighted, to discover 'who they were' and 'what happened to them' - both those who are mentioned on the war memorial and those who survived the war. They ranged from Private to Major, the sons of clergy, nobility or farm workers, and a range of occupations in civilian life - butchers, painters, cowhands and gardeners being amongst those mentioned. One, James Allen Preston, was a private in the Royal Berkshire Regiment who was 'mentioned' in the London Gazette in recognition of an incident near the end of the war, when during the attack on Mormal Forest, the commander of his section became a casualty, and James showed fine powers of leadership and remarkable coolness in directing the fire of his men. Another, Oliver Cyril Spencer Watson had been an estate manager before the war. He was awarded the DSO for gallantry and leadership in 1917, and in 1918 was posthumously awarded the Victoria Cross to him for his "most conspicuous bravery, self-sacrificing devotion to duty and exceptionally gallant leading". The majority of men from Wargrave were in the Army, but a few were in the Royal Navy, including Jesse and William Waldron, who came from Crazies Hill - the 1911 census records their father, James, as being a 'Naval Pensioner', and Jesse made a career in the Navy. His younger brother, William, was one of those involved in the Battle of Jutland, As well as a list of the ships each of them served on, the service record describes their height, complexion, hair and eye colour, and the tattoos they had (Jesse had "several sets of initials tattooed on his arm"). One name on the village memorial has long been a mystery, as 'William Wyatt' is listed there, but is not included on the similar list within the church. It was assumed that he was a member of the well-known village family who ran the St George & Dragon, but did not appear, for example, on the 1911 census for Wargrave. He was eventually found as a member of the Royal Naval Air Service, having 'joined up' in 1914 'for the duration'. He became a pilot at the No. 1 Marine Observers' School in Suffolk. He was out flying, with Sergeant L D Adcock, when he collided in midair at 300 ft with another plane of the same type flown by Lieutenants C Wright and E Jacobi. Sergeant Adcock was injured, but the other three men died as a result of the accident. Further research found that he was baptised at Wargrave in April 1881, his parents being William and Ellen - and he was of the family that ran the St George and Dragon! Other members of the village also 'played their part'. Wargrave was the location of an auxiliary hospital for wounded soldiers - one of the largest in Berkshire. 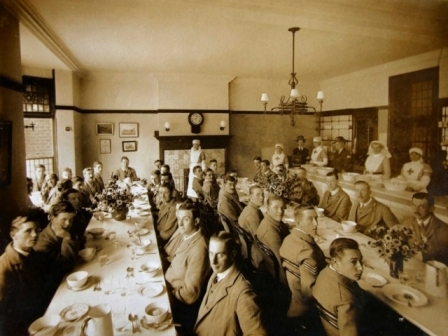 Initially, this was in the Woodclyffe Hostel in Church Street, but as the number of casualties increased, the Woodclyffe Hall was taken over to provide an additional hospital ward, and the ground floor front room of the Hostel (now the library) became a dining room for the patients. In addition, there was the "Wargrave Hospital Dressing Emergency Society" which was organised by Miss S E Choate, of Bear Hill, assisted by ladies of Twyford, Wargrave and the neighbourhood to make and supply surgical dressings from all suitable materials that can be washed and sterilised. Local newspapers published samples of the letters of gratitude which Miss Choate received, and eventually there were branches of the Society from Devon to Cheshire, and Herefordshire to Essex. By the end of the war about half a million dressings and comforts were dispatched to the wounded from Wargrave. The parcels went to Hospitals and Casualty Clearing Stations in almost every fighting area - Mesopotamia, Gallipoli, Egypt, Serbia and to American and Colonial Hospitals in England and France. A useful task started in and run from Wargrave, but who was Miss Choate? She does not appear in any census for Wargrave, nor in the parish registers. It transpires that she was the niece of a former American Ambassador. She was born in 1860 in Massachusetts, and had come to England in February 1915 'for the purpose of health' - but in 1918 the date of her return was 'uncertain'. Villagers collected various items for the many men serving in the forces. In the Parish Magazine it noted that "Gifts of tobacco, cigarettes and chocolate will be gladly welcomed at the Harvest Festival as on the previous occasions during the war" as presents for men at the front. In 1916, there was enough for 50 packets to be sent and further appeal was made at Christmas. After hostilities ceased, the parish got together to decide how to commemorate those who had lost their lives. 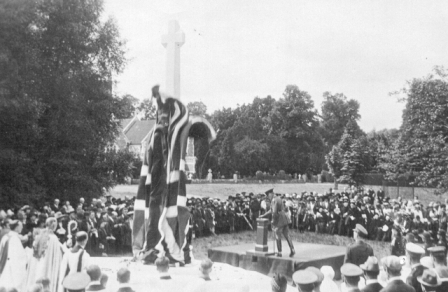 It was decided to erect a 'Peace Memorial' and the family friend of the Hannens, Sir Edwin Lutyens was commissioned to design it. Made of Portland stone, it was unveiled on May 28th 1921. The village, however, declined the offer of the War Office of a 'German Gun' - a 77 mm Field Gun and Carriage, to be kept in the parish as a public trophy. A resolution asking the Parish Council "to accept the trophy was lost by a considerable majority." And nothing more was heard about it! In all, 488 men in the Armed Forces are listed as having come from Wargrave. Of those, 55 are commemorated on the memorial -- to put this into perspective, the 1911 census gave the population of the civil parish as 2112 in the civil parish. The next meeting will be on Tuesday October 11th, Sue Hourigan, the conservationist at the Berkshire Record Office, will tell us about The Preservation of Archive Records, whilst on Tuesday, November 8th, Barbara Ratings will share some of her Experiences as a Vicar's Wife from Germany, and then on Tuesday, December 13th the Society will have its Christmas Party.